Adidas is, hands-down, the most recognizable soccer brand in the world. With over 90 years in the business, the brand has been delivering some of the best cleats on the market and is trusted by some of the greatest soccer players in the game. The very first pair of Adidas soccer cleats was made in a tiny workshop in Herzogenaurach, Germany by Adi Dassler, the founder of the company. Engineered to support all of a soccer player’s needs, the brand is still manufacturing some of the best shoes for the sport. 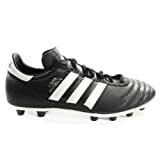 Worn by Lionel Messi, Robin Van Persie, Xavi, Manuel Neuer and countless other professional players, when you put on a pair of Adidas soccer shoes, you put on the same shoes that many of your favorite players wear. Whether you’re a forward, defender, goalkeeper or midfielder, Adidas makes a shoe for you. But which one is the right choice? We’ve rounded up the top 5 Adidas cleats for 2017 to help you find best shoes for your needs. Copa Mundial – The epitome of what a soccer shoe should look and feel like, the Copa Mundial is legendary. For the last 20 years, players of all levels have trusted their game to these shoes, and it’s easy to see why they’re such a popular choice. The kangaroo leather is a big part of the reason why so many players love these shoes. Leather is the preferred material for many positions because of its durability, support and comfort. Whether you’re going for the goal or taking a beating on defense, you can rest assured that your shoes can weather the storm. The dual-density, direct-injected FG outsole provides comfort while giving you the traction and flexibility you need to glide across the field. The EVA insole adds an additional layer of comfort, so you walk off the field feeling just as good as when you started. If you’re looking for the best all-around soccer shoe (and the most expensive soccer cleats), the Copa Mundial takes the cake. Messi 15.3 – Named after the star player Lionel Messi, the Messi 15.3 is light, flexible and looks great on the field. The synthetic upper has a textured pattern (a.k.a. the messiTOUCH X-ray) for optimal ball control, while the stud configuration provides flexible traction. No matter what position you’re playing, the Messi 15.3 will allow you to make cuts without causing you to lose speed. The design of the shoe is attractive, too, with black, red and lime green. The stud configuration makes this shoe ideal for play on firm ground (FG) and artificial turf (AG). Affordably priced, this is one Adidas shoe that players of all levels can enjoy. Men’s X 15.4 – Part of the new X lineup from Adidas, the 15.4 delivers unbeatable acceleration and traction, so you can make game-winning plays. Lightweight and comfortable to wear, these cleats are trusted by players of all levels – from casual to competitive and professional players. The synthetic upper features the brand’s X-Skin texture that maximizes ball control no matter how fast you’re moving. The X-Cage offers an additional reinforced layer that gives you extra stability, while the X-Claw stud configuration maximizes traction and flexibility without slowing you down. The X 15.4 is ideal for FG and AG, and comes in three bold designs: black/gray/yellow; yellow/black; black/gray/mint/white. Predito Instinct – The Predito Instinct is comfortable, durable and abrasion-resistant. With a leather finish in the forefront, these shoes can withstand the abuse of hard seasons. While the forefront may have a leather finish, the upper is primarily made of durable, soft synthetic material. The rubber sole allows for flexibility and support, while the cushioned studs prevent pain. The insole’s soft, breathable lining maximizes comfort while offering the additional support every player needs. Available in yellow/black and red/purple, these shoes are just as bold as they are comfortable. If you’re looking for a soccer shoe with a bold design, look no further than the Adidas Predito Instinct. Absolado Instinct – Designed for use on firm ground, the Absolado Instinct is an excellent shoe for forwards and midfielders. Maximum control and comfort are the two things that this cleat excels in. The synthetic upper is durable and abrasion-resistant, yet soft and supportive. The rubber sole is flexible, but still provides enough grip for explosive acceleration. A leather-finish forefront adds extra durability and comfort. On the side of the shoe is a 3D pass pad that lets you make passes with absolute precision – even in tight situations. The shoe comes in four bold designs: red/white/purple; black/white/infrared; yellow/white/shale; blue/white/gray. For unbeatable traction and ball control, it doesn’t get any better than the Absolado Instinct. Position: What are you playing? The position you play will determine which shoe you choose. Goalies need more traction, while forwards need more acceleration. Defense needs responsiveness and flexibility. Consider your position’s needs, and choose a shoe accordingly. Field: Where you play will also impact which shoe you choose. Most shoes in the Adidas lineup feature a stud configuration that is better suited for firm ground vs soft ground. If you’re playing indoors or on softer ground, you’ll need to search for shoes that are specially designed for these play environments. Price: Your budget will obviously play a role in which shoe you choose. However, it’s important to remember that spending a little more will get you better quality shoes. Fortunately, Adidas is a brand that creates high quality shoes in just about every price range, so you’re sure to find something that fits both your needs and budget. Design: The design of the shoe may also be important, and this goes beyond color. Adidas does offer shoes with either classic or new and modern designs. From bright and bold to neutral and traditional, there’s a style for every taste. There are also a variety of shoe profiles, so you can choose one that suits your preferences and your performance needs. This entry was posted on January 23, 2016 by admin.